(18/P009) TRENTON – The New Jersey State Forest Fire Service seasonal prescribed burning program is under way. The annual program reduces wildfire risk by burning the buildup of potential fuels such as undergrowth, leaves, branches and pine needles on forest floors. Motorists are also reminded to use caution when approaching areas where prescribed burns are taking place. Motorists traveling through these areas are advised to observe posted reduced speed limits, and to be alert to the presence of trucks and Forest Fire Service personnel. Prescribed burns, also known as controlled burns, will continue through the end of March, weather conditions permitting. The burns are generally conducted during late winter months to reduce the amount of smoke produced and when weather conditions tend to be safer for controlled fires. Prescribed burns help reduce forest fire risk before prime wildfire season, which typically begins in early spring when fallen leaves, branches and twigs are abundant. In addition, spring is likely to be dry, windy and warm. These weather conditions coupled with lack of new leaf growth makes forest debris more susceptible to the drying effects of wind and sun. Wildfires can have the greatest impact in areas where people live in or near forests, grasslands and other natural areas. The sprawling Pinelands region in southern New Jersey is especially prone to wildfires because its ecosystem is adapted to depend on periodic wildfires for releasing of seeds for reproduction. Controlling the buildup of fuel in this region helps keep the forest healthy. This season, the Forest Fire Service expects to conduct prescribed burns on approximately 30,000 acres. Most burns will occur on state-owned property such as state forests, parks and wildlife management areas, and other government lands. The service also will place increased focus on assisting private landowners and nonprofit organizations mitigate wildfire risk. In 2017, the Forest Fire Service responded to 753 wildfires, 74 percent of which were a quarter acre or smaller. The largest was a 3,477-acre fire in Wharton State Forest, Burlington County. During prescribed burns, Forest Fire Service personnel use handheld torches to set smaller fires to burn away fallen leaves, pine needles, fallen branches and other debris on the forest floor. Personnel consider wind, moisture and other conditions in setting the fires, which do not reach the forest canopy or cause significant loss of mature trees in the way that wildfires do. 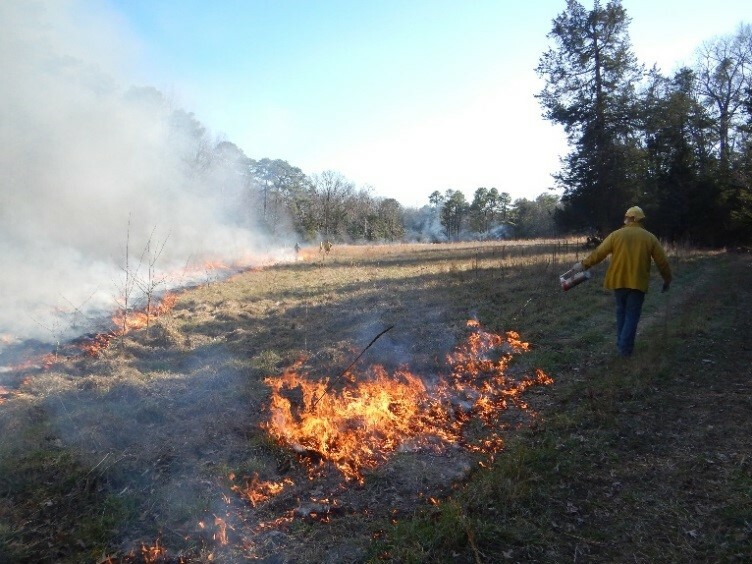 In addition to burning away materials that can fuel wildfires, prescribed burns help keep forest ecosystems healthy by improving wildlife habitats, managing competing species of plants and trees, controlling insects and disease, and recycling important nutrients into the soil. The public may contact one of the State Forest Fire Service’s three Division office at www.nj.gov/dep/parksandforests/fire/contactus.html to learn more about the prescribed burns program and where burns are expected to be conducted.